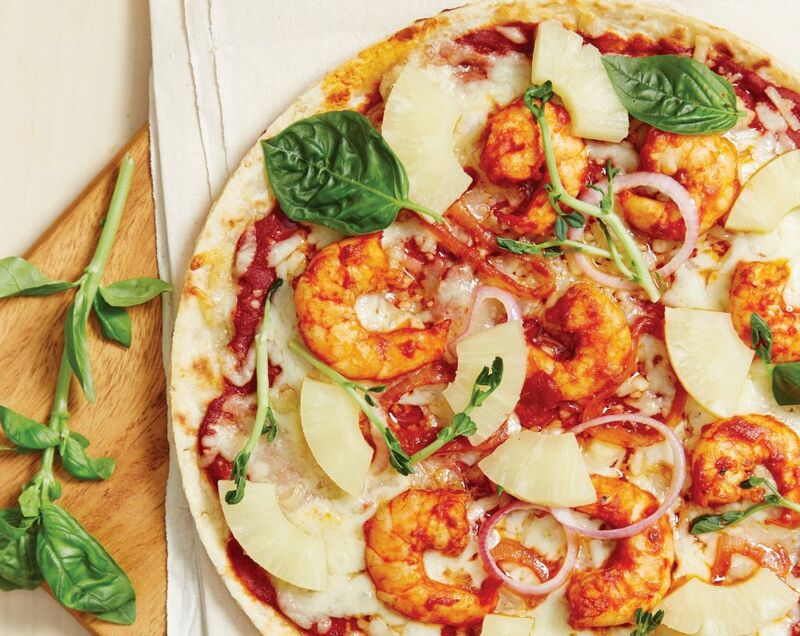 This Tom Yam Prawn Pizza with Pineapple made using the new range of Mission Pizza Crusts is a balance of sweet and spicy that’s sure to appeal to food lovers. Heat vegetable oil and then add in the onions, garlic, galangal, and ginger. Sauté until softened and slightly browned. Remove from the pan and set aside, leaving the remaining oils in the pan. In the same pan, add the chilli paste, kaffir lime leaves, lemongrass, coriander, shrimp paste, fish sauce, tamarind water, and brown sugar. Cook until the mixture slightly thickens before adding the other fried ingredients into the chilli mixture. Continue frying until the paste is thick and the oil starts to separate from chilli and surfaces. Set aside to cool down before sealing them in jars/cans. Warm up the oil in the pan. Cook the prawns for about 1 minute, and season with salt. Add in 1 tbsp tom yam paste (or more if you like it spicy) into the tomato sauce and mix well. Place plain pizza crust on a baking tray. Spread tomato sauce that was mixed with tom yam paste evenly over the surface of the pizza crust. Generously sprinkle shredded mozzarella over the pizza crust. Then add prawns and pineapple cubes. Remove pizza from oven, cut the pizza into slices and garnish with Thai basil leaves.